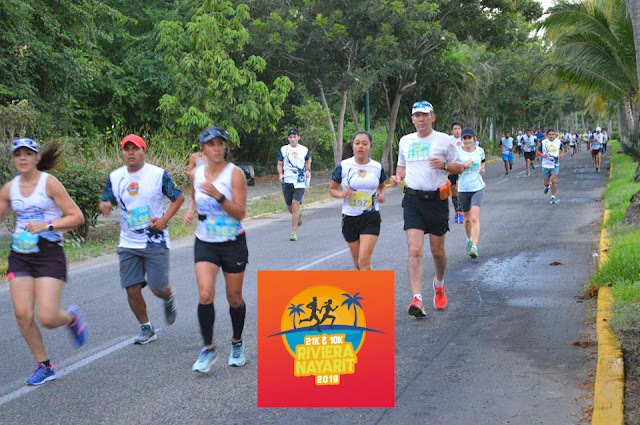 The prettiest route in Mexico, certified by AIMS, will be followed by more than 800 runners on Saturday, November 24th; there will be road closures in Nuevo Vallarta and Flamingos. The 2018 Riviera Nayarit Half Marathon and 10K celebrates its 10th anniversary on Saturday, November 24th, with the participation of more than 800 athletes that will run one of the prettiest routes in Mexico, located within the Fraccionamiento Náutico Turístico Nuevo Vallarta neighborhood. Both the Half Marathon and the 10K Athletic Race will be run along the development’s main avenues, including the Condominio Maestro Flamingos and the El Tigre Golf Course from 7 a.m. to 12 p.m. The route is standardized and certified by the Association of International Marathons and Distance Races (AIMS) and endorsed by the IAAF. According to Event Director Arturo García Ruíz Velasco, the rules and regulations set forth by the Mexican Federation of Athletic Associations (FMAA www.ateltismofma.com.mx) apply. Some of the development’s roadways will be closed to traffic on Saturday, November 24th from 6:45 a.m. to 10 a.m. Hotel staff, residents, and the general public are asked to take the necessary precautions and, if needed, get to work earlier. The same applies to those who need to leave the area in the morning, so as to avoid getting caught on one of closed streets. 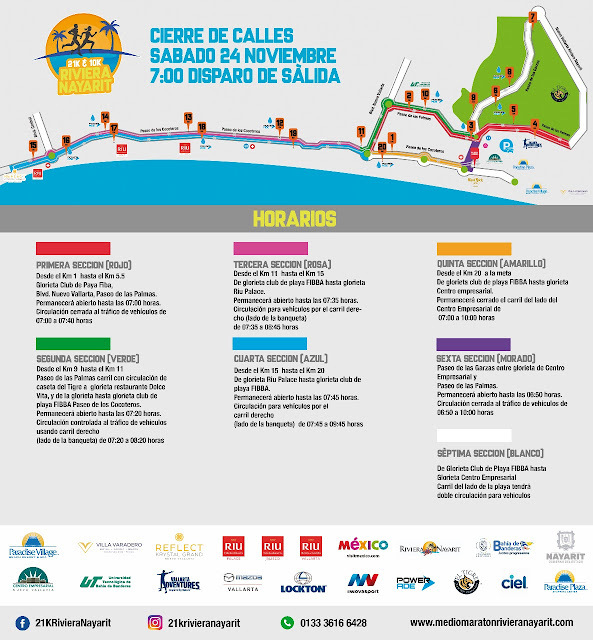 The Riviera Nayarit Half Marathon and 10K is organized by Conserviexpress. 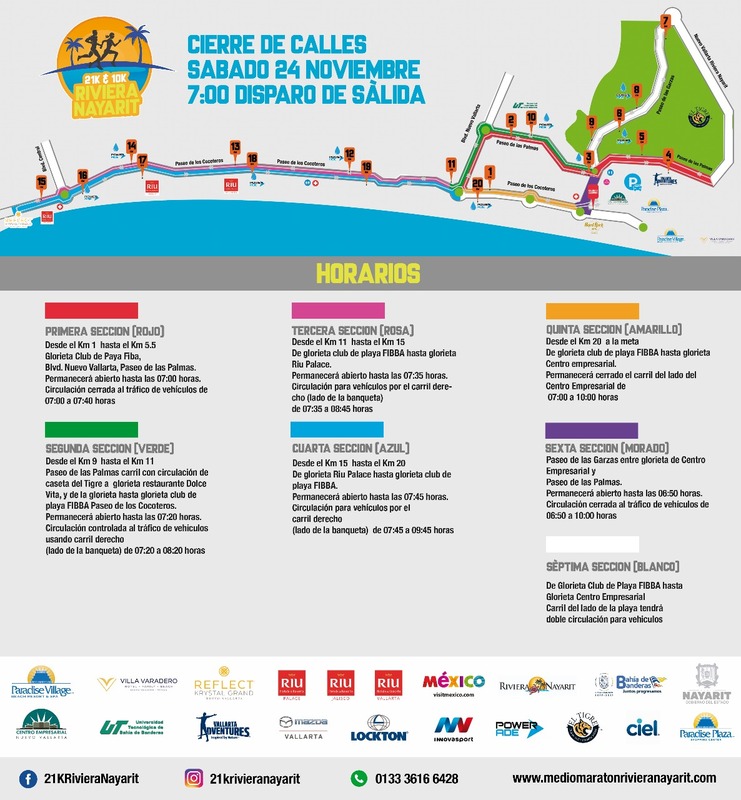 This year the Riviera Nayarit 21K will start and finish in the parking lot of the Nuevo Vallarta Business Center. The start gun will go off at 7 a.m. on the dot: the race will wind through several areas of the Fraccionamiento Náutico Turístico, the El Tigre golf course, and the Flamingos development. A 10K race will also be run at the same time, created for the runners’ friends and family. The packages will be distributed on Friday, November 23rd from 9 a.m. to 9 p.m. only at the Plaza Paradise in Nuevo Vallarta at Av. Paseo Cocoteros #85 south, second floor. Women: 18-39 40-44 45-49 50-54 55-59 60 and over. Men: 18-39 40-44 45-49 50-54 55-59 60-64 65 and over. The promotion received by the Riviera Nayarit from activities such as the Half Marathon & 10K—supported by the Riviera Nayarit Convention and Visitors Bureau (CVB) and the Bahía de Banderas Hotel and Motel Association (AHMBB)—not only attracts visitors, but it also helps to consolidate Mexico’s Pacific Treasure as a sports destination. These efforts are undertaken with the support of the Government of the State of Nayarit via its Tourism Promotional Trust (Fiprotur).